If you’re like most pet owners, you like to keep your dog or cat looking pristine and smelling good. And while there are groomers on just about every street corner providing bathing and drying services, it can cost a small fortune. What does a concerned pet owner do? Visit a coin operated dog wash, of course! Unfortunately, unless your dog weighs 1 pound soaking wet, attempting to bathe him in the family tub starts out with good intentions, but ends up more like an underwater adventure. The fact is, pet owners need more convenient, economical solutions for keeping their dogs clean, smelling good and happy. Is there really such a thing as dog bathing stations? 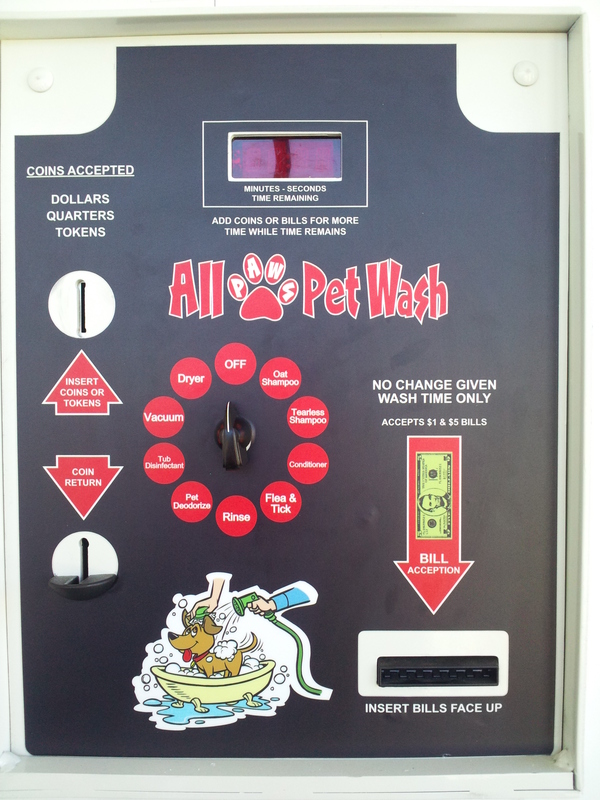 A coin operated dog wash that gives you the tools you need to wash your pet easily and without the hassle of wet floors or total chaos? Absolutely! Coin operated dog wash stations provide the ultimate in convenience and make what used to be complete pandemonium, relaxed and enjoyable. With availability 24 hours a day, 7 days a week, anytime is the right time to bring old Fido for a quick bubble bath and use easy to use pet wash equipment. How about on the way home from the beach? A coin op dog wash provides the perfect solution for muddy or sandy paws that are otherwise sure to do a number on the car, even with the mats in place. Besides, with a variety of different shampoos, treatments and even a dryer, you don’t have to bring anything except your pooch to leave with a cleaner, happier, better smelling dog. Our pet wash equipment brings convenience at your fingertips! Let’s be honest: everyone loves bringing their dog or cat to the groomer. But who can afford to go as often as our pets really need it? For most people, the truth is we wait until we simply can’t stand it anymore and then we pay the price. Why should we have to spend a small fortune to keep our pets clean? 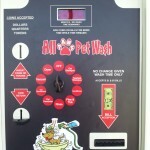 Coin operated pet wash offers the same great result, for practically pennies on the dollar. Save your luxury expenses for extravagant dinners out and keep your money where it belongs … in your pocket. Convenience. Bathing any dog at home just isn’t the easiest thing in the world. Not only do you have to get your dog in the tub, but you have to make sure that he’s not going to escape suddenly and turn your household upside down. We’ve all heard about pooches getting out of the bathroom or laundry area and treating all the furniture and rugs to wet footprints and sopping puddles. Plus, if you have a bigger dog breed, you might not even have a tub you can use. In that case, you have to hope that the weather’s nice enough to go into the backyard and use the hose. It’s not only messy and inconvenient, but it can make your dog less apt to enjoy grooming. Make your pup happier and protect your furniture by taking them to a coin operated dog wash.
Savings. Dog owners like you love to pamper their pets, but money doesn’t grow on the trees in the dog park. While it’s fine to take your dog to the groomer’s on occasion, the cost can start to add up quickly. This means you have to find a practical, economical alternative. A dog washing station can provide you with the affordability you crave, while still giving you accessibility to top-notch equipment. In general, a 12-minute session will cost about $10, which is change you can probably find in the couch — along with all those dog toys that you thought Fifi lost! You’ll be able to spend more on pet treats, organic food and that snazzy leash with the sparkles. Amenities. Wouldn’t it be great if you could turn your home into a pooch pampering palace? Unfortunately, that’s out of the picture for most of us. However, when you come to a coin operated dog washing station, you can expect access to some of the best amenities available for dog washing. You can get top-notch shampoo on site, so forget the need to buy and bring your own. You can even use the natural air dryer to keep your dog comfortable and facilitate faster drying. Who says that a coin-operated pet wash station can’t make you feel like you’re in the lap of luxury? Safety. Don’t risk your pet escaping during an indoor or outdoor bath that happens at your home. Wet dogs who are trying to get away from the bath have a habit of wreaking havoc, and may actually be alarmed by their wetness, leading to poor or rash decision-making. A commercial pet washing station that’s coin-operated has a heavy-duty door so you and your dog will remain safe and secure. For extra protection, always bring your pet on a leash and then secure the leash to a special hook during all bathing sessions. And consider bringing along a calming influence, such as your pet’s favorite squeaky toy or blanket. Is your poor pooch suffering from a case of the bad smells? It happens to all breeds, all ages and all doggy personalities. Even if you have a dog who primarily hangs out indoors, she’s going to eventually emit an odor. Dogs are unable to groom themselves, which means pet parents must come to their rescue. Take your dog to a coin-operated dog wash station and spend the time removing all the dirt, particulate and bacteria-laden debris that’s built up over the past days or weeks. Pay special attention to your pooch’s hindquarters and in between the toes on the paws. These are frequently places where grime starts to take its toll. Be sure to carefully wash your dog’s face using a soft cloth. Never submerge the dog’s head in water or rinse it off. Not only can that get shampoo in the dog’s eyes and mouth, but water can settle in the ear canal. Many dogs end up at the vet’s office for ear problems caused by inadequate bathing techniques. If you’re tired of being able to smell your four-legged pal from a mile away, it’s time to head to the nearest coin-operated dog bathing station. Your pet — and your nose — will appreciate it! Questions? Contact Us Call Now: 877-880-6056 Request a Quote Today!